Sheldon would have been 73 today. On November 3, 2003 Sheldon explored another mode of transportation. This was his first time riding a horse, Walter, a large (17 hands) 9-year old draft cross. Sheldon insisted on riding in shorts and on using his bike helmet with eagle on top instead of the usual required gear. Out on the trail, all went well until Walter started trotting on a downhill. Sheldon lost his seat and fell off in the grass. One of the other riders who came to help Sheldon noticed his helmet and said, “The eagle has landed …. ” Sheldon stuck with bicycles after that. Sheldon died on February 4, 2008. Walter is living in the Midwest as a beloved family horse. This entry was posted in Updates and tagged Apollo 9, eagle, fall, helmet, horse, humpty dumpty, NASA, Sheldon, Sheldon Brown, sheldonbrown, sheldonbrown.com. Bookmark the permalink. To be fair, horses are much harder to stay on top of! And I love that he chose that helmet – there’s actually some merit to it. 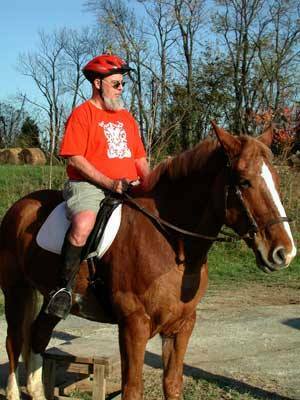 In peering through my state’s laws, I found that, in the state of Virginia, it’s legal to ride a horse on a highway as long as you’re wearing a shiny enough hat. He picked up on this crucial safety requirement!